Brazed Plate Heat Exchanger are used in refrigeration plants as condensers, evaporators or with other specific functions. The heat exchangers are compact and space saving. We are in the position to cater the needs of different application from the brand leaders. Our name is enlisted amongst trustworthy trader and supplier of broad range of Brazed Plate Heat Exchanger. We offer them to our patrons after testing them and in safe packaging to ensure their correctness. These are used in the market for their durability and reliability. We provide these at affordable rates and as per the customer’s needs. 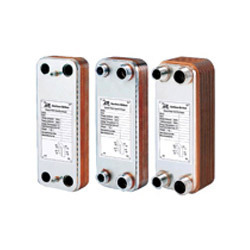 Looking for “Brazed Plate Heat Exchanger”?